DRIVE EVENT OR EXPO TRAFFIC. The iGiftBag is a powerful tool to drive event, exhibit, show or expo traffic. Give your event sponsors an engaging touchpoint to reach attendees before your event with offers, games and free items designed to drive traffic to specific venues, expo booths, sponsors or featured performers. We’ve created special gift apps to help your expo sponsors to use the igiftbag to drive sales and brand awareness. Enable your customers to access and use your gifts on-the-go through a locale on their mobile phone or tablet with our personalized “My igiftbag” gift save and plan features. IDEAL FOR EVENTS OF EVERY SIZE AND BUDGET. The igiftbag’s flexible format makes it the most dynamic and engaging digital rewards and sponsorship product to hit the market! 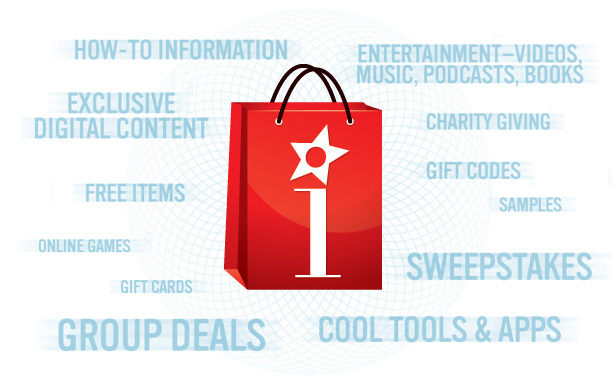 Whether adopted as an event virtual goodie bag, deployed as a loyalty and rewards program, or as a sales and fundraising tool, the igiftbag can can be used by a wide range of organizations— events, publishers, membership organizations, sports and entertainment brands, schools, charities, venues, hotels and tourism promoters, among others. THERE’S AN IGIFTBAG FOR EVERY KIND OF EVENT. Using our helpful templates, you can create an igiftbag easily for your event.